The Pirates link up with Global Football Limited moved into its fourth year with the visit of this High School side. Global Football take teams from both College and High School Level on educational trips around the world and incorporate challenge matches into their schedule. 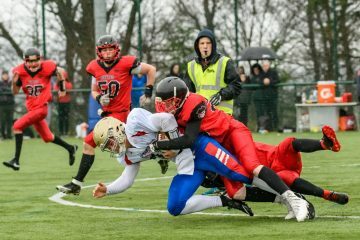 In the three previous years, the Pirates’ Senior side have faced Division III College teams, but this time around it was the Junior (U19) side’s turn to take part. Team Stars & Stripes travelled with a small squad, made up of players from schools in Ohio and Pennsylvania, and dressed only 13 players on game day. However, these boys went on to give a textbook display of “iron-man” football in a game where the only concession to their numbers was the simplification of Special Teams to minimise the possibility of injury. This encounter took place on a wet day at Stirling University, with the Wallace Monument looking down on proceedings. EK were first on the ball but went three-and-out before punting. The visitors wasted no time in taking the lead with Jack Kosar running the ball home from 49 yards on his second carry of the game. Matt McGinn added the PAT to make the score 0-7. Kosar soon added his second TD, this time from 29 yards, although an unsuccessful PAT held the advantage at 0-13. The second Quarter continued in much the same vein, the Pirates working with small gains while Team SAS scored on almost every possession. Next to find the endzone was QB Ben Gerber, carrying the ball home on a 1st-and-goal from the 7-yard line and McGinn converted. This was followed quickly by the first passing TD of the day, Gerber finding Nick Chermol for a 13-yard score. Andrew Oriani then ran in the 2PAT to make it 0-28. Kosar’s third touchdown came on a short burst from 3-yards and holder Jeremy Neylon passed to Chermol on the fake PAT to add the 2-pointer. East Kilbride finally got on the scoreboard late in the first half. A 40-yard pass completion from Scott McKigen to Michael Paton set up 1st-and-goal from the 3-yard line. Jack Cochrane got the TD on 2nd Down then also ran in the 2-point conversion to reduce the deficit to 8-36. However, there was still time before the interval for the visitors to score again. A quick, 6-play drive, along with judicious use of their time-outs, allowed Oriani to run in from 8-yards, and despite the missed PAT, lead 8-42 at the break. With a running clock in place for the second half, there were fewer scores. In the third period, Gerber passed to Kha’Jay Frazier, taking the ball to the 2-yard line as the quarter expired, before Neylon charged into the endzone on the first play of Q4. Later in the period, Kosar got his 4th TD, when he recovered his own fumble, the ball fortuitously bouncing straight back into his hands without even having to break stride, before powering the remaining 22-yards to paydirt, McGinn’s PAT rounded off the scoring at 8-55. Despite the almost inevitable heavy loss, acting HC Nicky Smith was confident that his players would benefit from the experience, having witnessed the standards that they should be working towards. 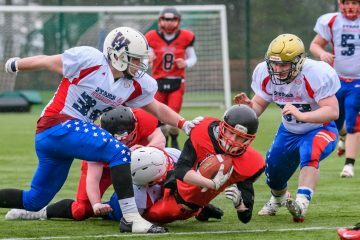 Anything they have learned will be put to the test when they open their 2019 League campaign away to Highland Wildcats on April 28.